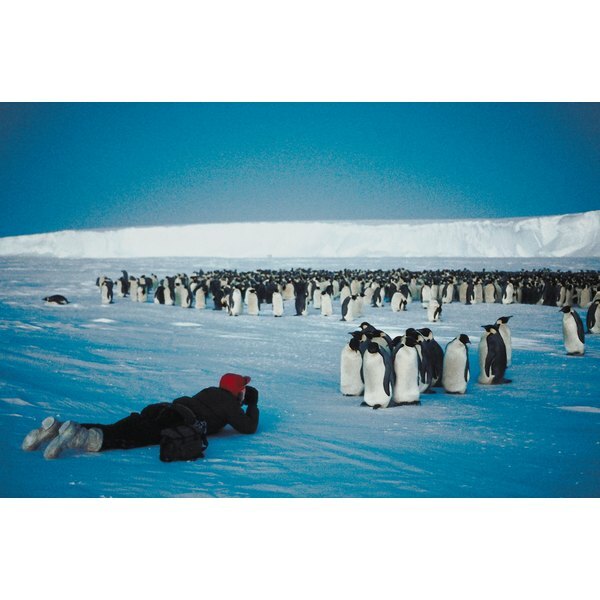 Scientists working in Antarctica endure temperatures to -70 centigrade, or less than -90 Fahrenheit, according to Steve Loucks and Deb Weatherbee of Missouri State University. Truckers on Canada and Alaska's ice roads work in conditions to -55 Fahrenheit. From oil rig workers in Alaska to mountain climbers on Everest and recreational skiers in Colorado, people work and play in extremely cold weather. Wearing the proper clothing will protect you from frostbite and hypothermia in extreme cold. Until well into the 20th Century, people who ventured into extremely cold climates relied on layers of natural fibers and materials to protect them. Wool, leather and fur were used most often. Displays at the Peary-MacMillan Arctic Museum at Bowdoin College in Brunswick, Maine, show Arctic explorer Robert E. Peary dressed in fur and sealskin clothing, made by native Inuits, to ward off the extreme Arctic cold. While these materials could keep you warm, they were heavy and bulky and some materials, such as wool, lost much of their warmth when wet. The many layers of clothing required to stay warm in extreme temperatures could also make it difficult to move. Arctic explorers aren't the only ones who need extreme cold weather clothing. People who work outdoors in cold climates, such as fishermen, soldiers and scientists, need protection from the elements as well. Recreational ice fishermen, hunters, skiers and other athletes need to stay warm in frigid temperatures. Mountain climbers must endure extreme cold as they conquer the world's highest peaks. Extreme cold weather clothing should be insulating, lightweight, wind resistant and waterproof and allow for flexibility of movement. The fabric should wick moisture away from the body, so you don't end up wet from sweating, then chilled as the extra moisture robs you of heat. Some cold weather clothing includes features such as pockets for chemical heat packs and zippered vents to allow you to regulate the amount of cold air you let in, depending on your activity level. Clothing for special activities, such as skiing, may offer extra padding on the knees and seat. All winter outdoor clothing should have flaps over zippers or snaps to seal out the wind. Larger tabs or zipper pulls that allow you to adjust the clothing while wearing mittens will keep your hands from freezing in extreme cold. Dressing for extreme cold starts with a base layer of silk, polypropelene or polyester fleece. Base layer garments are thin, flexible and lightweight. Separate sweaters, pants, vests, gaiters, hoods or caps, face masks, mittens and socks allow you to layer clothing. Air trapped between layers acts as insulation, according to Princeton University's Outdoor Action Guide. You can more easily regulate your comfort by adding or removing layers. The warmest footwear for extreme cold are insulated boots with thick soles that protect your feet from cold seeping up from the ground. Felt boot liners and battery powered boot heaters also help your feet stay warm in severe cold. Modern materials include polyester fleece, Polartec, Capilene, Gore-tex, Outlast and other brand name technologies. These high-tech fabrics offer light-weight insulation. The fabrics are breathable, allowing water vapor in the form of sweat to escape, while blocking cold air. Many of the fabrics are waterproof or water resistant, or treated to be so. Some also offer treatments designed to kill bacteria, meaning your cold-weather gear won't end up smelling like a gym locker after a few wearings. Wool and down remain popular natural materials for cold weather gear. Wool is often combined with high-tech fibers for socks, sweaters and hats. The fluffy nature of down allows for lots of natural air pockets that help provide good insulation. Down is used in vests and jackets.